Never before has such awesome firepower and excitement come together. 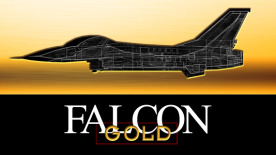 Falcon Gold is the complete collection of updated versions of Falcon 3.0, MiG-29, Operation: Fighting Tiger and Art of the Kill dogfighting video. This Falcon Gold edition is a tremendous value and an incredible experience. The action never stops as updated flight models make the MiG easier to master and the Hornet more competitive than ever. Your reward? More challenging combat among the widest variety of air, land and sea targets. Plus with 7 campaigns and over 630,000 square miles of real terrain, you'll literally have your hands full of nonstop action. No other simulation gives you the depth, the thrills and the realism because nothing shines like Falcon Gold.